Meet on the top floor of the Kalamazoo Mall Parking Ramp #3 (Alamo Theater Ramp). Enter the ramp from Portage Rd, just south of Michigan Ave. Peregrine Falcons have nested in downtown Kalamazoo since 2010. 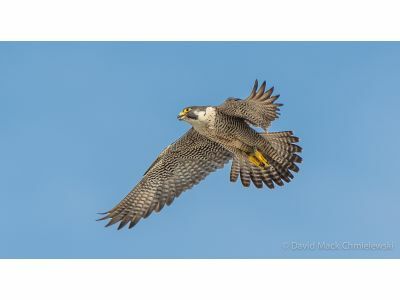 Join the Audubon Society of Kalamazoo leader Jim Ratliff on the top floor of the parking ramp to scan the skies for America’s fastest falcon. This trip might allow observers to see views of the birds flying over the Kalamazoo skyline, perched on high buildings, with possible return trips to the nest site to feed young. Parking fees are based on visit duration. Binoculars recommended. A spotting scope will be available for participants.